The Bible is meant to be interpreted by allowing the clearer verses help us understand the more difficult ones. This concept is as easy as understanding the importance of simple arithmetic before attempting to grasp the concept of algebra, geometry, trigonometry, etc.. Learning what addition is all about is a step that we must take before A (squared) plus B (squared) equals C (squared) makes any sense. Mathematically speaking everyone agrees that this makes sense, but unfortunately there are many people in the religious world who do not follow along with the same concept when it comes to certain doctrines that originate with the thinking of men and women instead allowing the truth to be seen through more plainly spoken verses. Such is particularly the case when it comes to the various teachings of premillennialism and the unfortunate presumptuous faux-pa points that it stands on despite the clear teachings of the Bible. The truth is, almost the entire foundation of premillennialism comes from the book of Revelation (particularly chapter 20), which is a highly symbolic chapter from a book of prophecy that uses heavy symbolism in ways which must be understood in light of the clearer meanings (plain speaking exhortations, reproofs and examples) found in the rest of the Bible’s letters. When one seeks to and follows through with rightly dividing the word of truth (2 Timothy 2:15) it becomes much easier to rightly divide any time-line that God has revealed and thus avoid exegetical studies that become embarrassing eisegesical mistakes. Excellent! Your math explanation is right on. Thanks brother. I’ve found if you can take an example from something that most everyone agrees on (or understands) then it makes it easier for us to come to some common ground on things that we don’t. Unfortunately, that is the essence of Premillennialism. Brought into existence by people like John Darby and popularized again by the “Left Behind” book/movies series from several years back. I used to believe in it too, due to Baptist doctrine. I don’t have anything else about Premillennialism here but you can check out a few other posts, some by me and some by others, in TFR by clicking here. Read the articles and commented on a couple. I don’t know…lots here I don’t understand. I will probably need to do a deeper study when I get a chance. It’s unsettling to think I may have been wrong about this, too. Oh my goodness! What have I been right about? Lots. But things like this is what happens when you get a different church under different trees teaching different things. I don’t believe in the majority of things I was was raised to believe in either. Yes, I’m starting to find that out. A part of me wants to just stop and not find out any more, but another part wants to keep going and know all that is out there. How did you feel when you started finding out that most things you had believed in were not true? I wish I could say that knowing truth is great, but it opens up a whole new set of emotions for me. Unsettling. A little angry. Kind of like “The Matrix” if you ever saw that movie. It was just a very eye opening experience that make me dig deep at a fast pace. Good rule of thumb I kept in mind was to view the scriptures in a way that they compliment each other instead of contradict. Contradictions come from a wrong point of view and not due to actually inconsistencies with God’s word. Let the simple and plain explain the more difficult passages. I did not see a private email address for you or I would have sent this message privately. Feel free to delete it from the comments if you want to. This kind of takes up where our discussion left off on this thread. 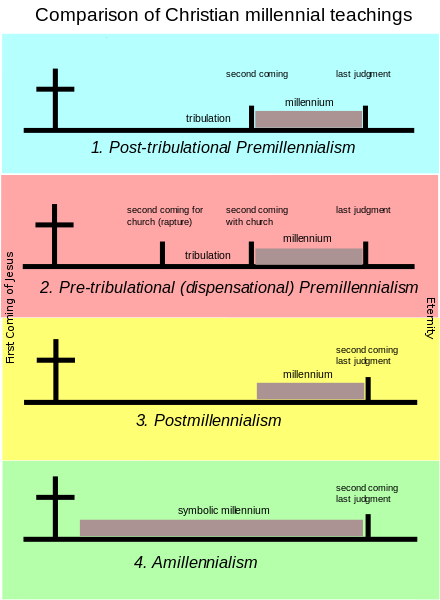 I wanted to let you know that my views on Premillennialism have changed quite a bit since we had our last discussion about it a few months ago. I also want you to know that I really appreciate the kind and patient way you discussed it with me. I know it isn’t easy to study with someone whose thoughts are all over the place. But you did help me. A lot. I took your comments and studied them and looked up the scriptures. Our discussions were the first step in Jesus’ leading me to His truth. At the time of my last comment on this thread, I was beginning to see some flaws in my logic. In my heart I knew you were probably right because of your knowledge of the scriptures, but I backed away. I did not want to be wrong. Partly pride. Partly fear. But God did not let it go, and I kept thinking about it. This week was ground zero for my moment of truth. I won’t go into details, but through a lot of study and prayer, I’ve come to realize that I’ve been wrong in my premillennial beliefs. I was so sure of it all, but I was wrong. There will be no Rapture, no Anti-Christ, no Armageddon, no 1000 year reign. That hurts. A lot. But it’s God’s Word. I’ve believed a lie for decades because I trusted in the false teaching of people, and a few random Bible verses. At least now I know the truth, and that is huge. No more lies and wondering if I will be “left behind”. The realization that I’ve been wrong about something so important as this doctrine leaves me feeling somewhere between sad and angry; it’s also little like grief. Mostly I feel sorrow for believing a lie that goes directly against something Jesus himself taught his disciples about His kingdom. What an insult to my Savior! This is all a little overwhelming, but Jesus will walk me through it. Please pray for me as I seek to repent and lay all this at the feet of Jesus. Good to hear from you. I emailed you (it’s from deadkins13). Growth takes time. I don’t believe your beliefs were held with any intention of harming others (the same as my beliefs that I have previously held), but as you realize it can be hard to accept change at times. I will always be glad to help you to the best of my ability…which at times may be lacking. I don’t understand it all, but I’m more than willing to share what I believe and why. Have a great night, sister.